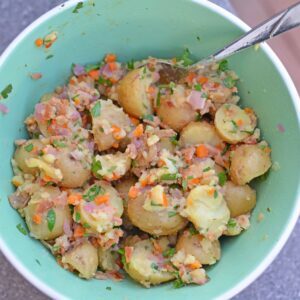 Bacon Potato Salad can be served hot or cold and uses veggies and BACON! This is a NO MAYO potato salad! The perfect make ahead side dish. Fill a large Dutch oven or sauce pan half way with water, bring to a rolling boil, then add 1 tablespoon of salt and whole potatoes. Boil for 10-15 minutes, until potatoes are easily pierced with a fork. Drain. Meanwhile in a small sauce pan, fill half way with water and add 1/2 cup red wine vinegar, bring to a low boil. Add sliced red onions and boil until soft and flexible. Drain and finely chop. Cut all potatoes in half, add 4-5 potato halves to a large mixing bowl, add Dijon mustard and mash well using a potato masher or a fork. Combine remaining ingredients to the bowl and toss to combine evenly. Refrigerate until ready to serve.